Following on from yesterday’s post I now have have OpenMoko running on my Treo. When I next have some time to spare I’ll have a go at hacking support for the Treo’s GSM chip into OpenMoko’s gsmd, then it’ll be possible to make phone calls through OpenMoko’s phone application :). Eh, I think that’s all I have to say. Very cool stuff. How’s the start up time? 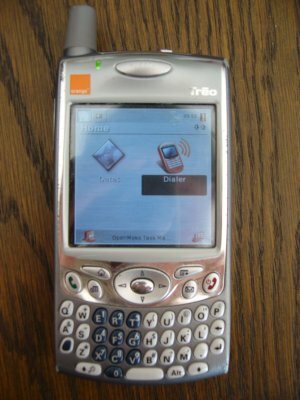 How does the interface do on the comparatively small Treo screen? Startup time isn’t great, about 1 minute 30 seconds (PalmOS takes a little under 30 seconds). The interface suffers a bit due to the screen size, I intend to shrink the icons for the main menu system (so you can seem more than just 2 items at once), but the dialer application is still a bit cramped (usable though). Does it run fast enough to be a viable alternative to PalmOS? Will your installation procedure work on a 680 or one of the Windows Mobile Treos? I think all in all, Opie (which is what I installed in the previous post) is a better environment for the Treo (but it lacks any sort of a phone application at the moment); it’s more responsive and works with a small display better. I believe it should be possible to rebuild the kernel for the 680 and 700wx (at least there are defconfigs for these in the palm4linux SVN repositories). I also intend to have a play with GPE; if that’s more responsive than OpenMoko I might try to get the Treo’s GSM chip working with Gnomunicator instead. I have a treo 650, sitting on my table.. I’ll be pleased to install openmoko..
if I’m understanding properly, is the phone section not working yet? That’s correct, the phone section isn’t working yet; however I’d suggest you install Opie (following the instruction in my last post), it’s a lot more useful on the Treo. I ve got a Siemens SX56 with Windows Mobile…some one know if OpenMoko will work in my phone? nice, are there plans for a port to Palm Treo 750 ? Any more luck with OpenMoko or GPE? What’s the status of this work? Does it make calls and so on now? Congrats on all of this work. really great. How is it coming with the Treo 650? I have one (Cingular unlocked) and the PalmOS interestingly cuts out the microphone when the screensave function activates. Unless you are using Bluetooth or wired headsets. Plus, I can’t set the screensave function longer than 30 seconds. I would welcome OpenMOKO when it is fully functional (including the phone part) and can synchronize with my Outlook contacts/calendar (no choice, that’s what we use here). Maybe use Evolution? Anyway, great piece of work, folks. I too am wondering if there are any updates on getting the phone application part working on the treo 650? It also works with treo 600? Hello,this sounds very interesting, Is there a site I can go to so that I can try installing this on my treo 650 as well? Both zefanja and yourself report having been successful in running openmoko in treo 650 systems: Great!!! I have spent the last week looking for documentation and compiling openmoko. I just need to achieve the final step which is actually booting it from the SD card on my treo 680. Can you help me (- actually many of us 🙂 -) out by outlining the steps you followed like you did on your post for June the 30th 2007. Thanks. Just use an ext2 file image containing openmoko instead of OPIE, and modify the linux.boot.cfg to point to it. I followed your howto to set my Treo 650 with Opie, and worked great. As you said, with the same procedure i tried to install openmoko in my phone, but I couldn’t find a bootable image (neither the boot params) to store in my SD card. Would you give me a little hint? I got few Palm treo 650 phones, i’m interested to install linux on those phones. I’m not a linux expert, please help me by providing the step by step instructions and files required for install. mike, did you ever get the phone function running? If you’ve ever been too tired and couldn’t finish a academic paper, then you’ve come to the right place. I assist students in all areas of the writing steps . I can also write the paper from start to finish.